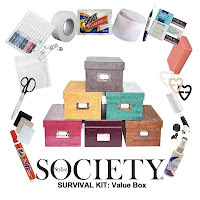 Society Stylist, Valerie Elizabeth, says she created the Society Stylist Survival Kits after getting such a positive response to the kits she gives her personal styling clients. "We all face our own fashion styling emergencies. I can't tell you how many times a Shout wipe or Instant Stain Removal Pen has saved my blouse after a spill at lunch. My lint roller and deodorant remover sponge have to work overtime to keep my favorite Little Black Dress looking crisp. My must-have survival item? Dryel dry cleaning products; they are the perfect solution when the local dry cleaner is closed." 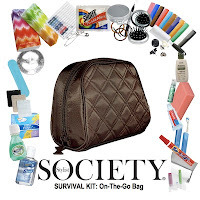 On-The-Go Bag ($50) includes endless solutions to help you survive any fashion styling emergency, and will arrive packaged in a stylish chocolate brown quilted bag by Perricone MD. Whether you need to- sew a button back on at work, freshen your breath after too much garlic at dinner, get a stain off your blazer before an interview, remove cat hair from your black pants, remove deodorant from your Little Black Dress or try to salvage a broken nail- this kit has everything you'll need on-the-go. Value Box ($75) is a perfect toolkit to help the frugal fashionista survive any fashion styling emergency. This box features a selection of different products to survive those emergency situations where one dreams of having a professional stylist there to help. Some of the kit favorites include wrinkle release spray, bra converter clips that can instantly change a traditional bra to a racer back style, no-stitch tape to fix a fallen hem in just 30 seconds with the help of an iron and the life-changer, a four pack Dryel at home dry cleaning kit, which provides the materials to clean up to 24 garments. The reusable products in this kit will pay for themselves time and time again. VIP Trunk ($250) is packed with endless items to survive any fashion styling emergency. The trunk contents are patterned after the kits Society Stylist provides to each of their personal styling clients for those moments when a stylist can't be onsite to help. The kit is packaged in a black trunk reminiscent of the traditional vintage train case. It features everything you'll find in the Value Box and so much more. Highlights include special wash bags for lingerie and other delicates, a sweater stone to remove pilling from well-loved sweaters, red wine remover for the unfortunate holiday party faux pas, silver polishing cloths to polish your jewelry, shoe pads for your tired feet, and Dryel at-home dry cleaning products with the potential to clean up to 42 garments. DOUBLE BONUS: Purchase a Society Stylist Survival Kit: VIP Trunk by December 31, 2011 (or while supplies last) and receive a double bonus!!! With your purchase you will receive a Society Stylist(R) Gift Card good for $50 in services and a Society Stylist Survival Kit: On-The-Go Bag, a $50 value. The Society Stylist Survival Kits can be ordered online.